The Azienda Agricola of the Brothers Cervino lies on the hills surrounding Canicatti in the Province of Agrigento (Italia-Sicily). The Company dates back to the early 1960’s when its founder Salvatore Cervino set out to build what has become a pillar of excellence in the local economy through the production and marketing of premium quality grapes for the table. Today, Cervino Interfruits is successfully managed by Salvatore’s sons : Michele, Gioacchino, Paolo, Maurizio, Fabio and Massimo each of whom contributing to the strength of the company by controlling individually the particular aspects of the production with the kind of dynamic enthusiasm which can only come from total family commitment. The IFS quality management includes measures to ensure defined quality requirements of the provided certification programs as well as to control the implementation of IFS standards in practice. Cooperation of IFS with the certification bodies is a precondition for a successful quality management. The relevant regulations are formulized in the standard and Annex 4 of the framework agreement of the IFS, which has to be signed by the certification bodies. IFS-certified companies are obliged to comply with defined standard requirements. The respective IFS standard provides appropriate information about the IFS quality management system. But information about this topic can not only be found in the IFS standards. In accordance with the framework agreement certification bodies are committed to inform the respective companies, where they perform IFS audits, about the Integrity Program of IFS. To guarantee an ongoing further development of the IFS quality management procedures regular meetings of a Quality Assurance Working Group, consisting of international representatives, take place. Additionally the results of the IFS Integrity Program (and the Food Check program) are presented to national and international working groups of IFS and are discussed with focus on the efficiency of the different quality assurance measures. Cervino Interfruits is totally committed to protecting its consumers from the hazards of pesticide residuals and to reducing their global impact on human health and on the environment by employing integrated protection strategies such as the gender confusion technique for fighting the grapevine moth. 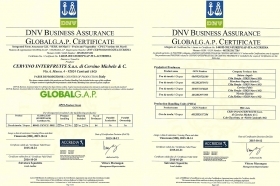 In support of this ideal the company has adopted the GLOBALGAP protocol which represents the realistic guideline for optimum agricultural practices. the grapes that must be transported and stored for longer periods. di Cervino Michele & C.
Formal financial backing since 2010 of Orangutan Foundation International. Organization dedicated to the conservation of wild Orangutan and their rainforest.